Today, you will be picked up from your hotel in Cape Town and transferred to the office to host a safety briefing where we will check through all your items of polar clothing and ensure they are right for your journey. There is a small clothing shop where you can purchase or exchange items should it be needed. We will also be explaining the latest weather forecasts and providing the latest information as to when our estimated time of departure will be. 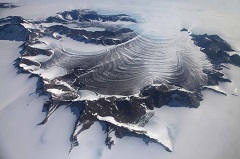 This morning you will fly to Antarctica (5hrs) and cross thousands of icebergs as you pass over the Southern Ocean. During the flight, you cross into the polar circle and into 24hrs continuous daylight. Landing on the specialist ice runway named ‘Wolfs Fang”, you will immediately be able to appreciate the vastness of your surroundings as the horizon seems to infinitely stretch off into the distance, punctuated only by a row of jagged mountains peaks. A separate aircraft will then transfer you to your luxury camp where you go for a gentle trek around the Oasis. Settle into your camp and do as much or as little as you like each day. Each day, field guides will suggest a number of excursions and activities for you to choose from. They can be easy and relaxing, or adrenaline-charged. It’s entirely up to you. 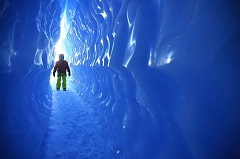 You can go on gentle treks to a series of ice tunnels or venture further towards the coast, to where giant ice waves rise up from the ground in surreal formations. From relaxed picnics, to visiting one of the local science bases – it’s all about doing what you want to do. 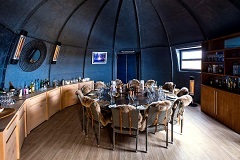 For those after more excitement, the expert guides will teach you the skills of a polar explorer. There is technical rock climbing, mighty abseils and even zip-lining. 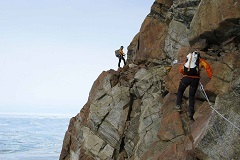 Guides can push you as far as you want to go. Whether you are Bear Grylls wanting to summit unclimbed peaks or you are there just to experience Antarctica’s majestic scenery, our job is to ensure you are warm, safe and doing whatever it is you want to do. 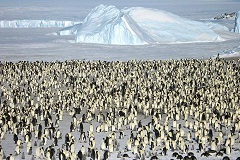 Today you will fly 2hrs across Antarctica, providing immense views of the high polar plateau, before landing at the Emperor Penguin colony of over 6,000 penguins and their young chicks. Both are totally unafraid of humans and will come within a few meters of our group, immersing you in the noise, commotion and the sheer beauty of it all. This is one of the greatest, and yet least seen, wildlife events on the planet. You will be among the very few who have ever witnessed such a spectacle and be able to see the real life stars of “March of the Penguins”. Today you can explore the ice waves beneath your camp, delving into the series of ice tunnels that are as surreal as they are beautiful. 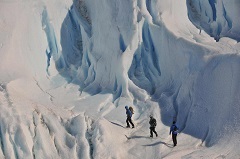 You are able to walk right through them and experience the still air and bizarre ice formations that are carved by melt water. The day ends with a visit to the nearby science base to learn more about their work, followed by a sauna. You will leave early in the morning in the DC3 Basler plane. You will fly across stunning mountain ranges before landing at 83 degrees South to refuel. You will have a chance to walk around the high polar plateau before continuing onto the South Pole. At the designated marker, you will be at the lowest point on earth. A place with no more East, South or West – only North and you will be able to walk around the world in just a few paces! At the South Pole, you will have lots of time for photos, a tour around the base and a chance to stamp your passport before camping down for the night. Please bear in mind that the South Pole is situated at an apparent altitude of 4,000m with an approximate ambient temperature of -25oC. Those with pre-conditions for altitude sickness should not choose this option. After a night spent camping, you will be given a hearty breakfast before boarding the plane once again for the flight back to your luxury camp. 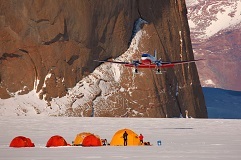 The flight is the perfect chance to really appreciate the immense scale of Antarctica, before you return to your camp for a three-course dinner and champagne to celebrate your achievement. This is an easier day with talks from our polar explorer staff about some of the lesser known history of Antarctica and their world record-breaking expeditions. Then its time for kite skiing around camp, followed by a giant abseil off the nearby Nunatak mountain. The flight out of Antarctica will be the last of your unforgettable Antarctic memories before you delve back into the noise and heat of Africa. On arrival you will be transferred to your hotel. Whichaway camp is totally unique and the perfect base from which to start your adventure. 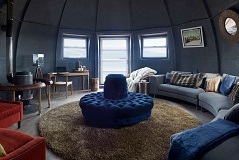 There are six state-of-the-art sleeping pods that are heated and designed for two people in each. At just over 6m (20ft) in diameter, they are also spacious, with a writing desk, wash area and toilet. For guests travelling separately, the room can be partitioned for privacy. The rest of the camp comprises a shower pod, kitchen and three centralised pods that make up the reception, lounge and dining room. While the exterior is made from cutting edge materials, the interior has an old-world feel with rich textures. Here you can relax, enjoy the fantastic food from our award-winning chef and take things easy. The dining table accommodates 14 people and is the ideal space for sharing adventures and enjoying great food. 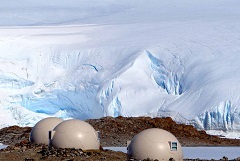 Busy days exploring Antarctica are sure to work up an appetite and hearty breakfasts, elegant lunches and three course dinners will mean you are well-fed whilst staying at the bottom of the world. 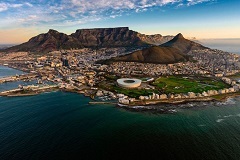 It is recommended to arrive one day prior to your safety briefing day in Cape Town. This is a reserve day in case we need to bring the flight forward due to weather. The maximum passenger number for this tour is 12 passengers. *Polar clothing includes one heavy, insulated down jacket, one heavy, insulated down pants, one over mitt, one pair Baffin boots (rated -100 degrees, warm and comfortable, used for walking and cross-country skiing) and one sleeping bag. Additional clothing can be purchased. Contact us for more details.